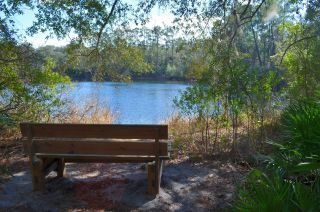 Blue Pond Park is located on Highway 17, 2 miles north of Pomona Park, FL. There is parking for visitors and a restroom facility. Picnic tables and a covered pavilion is available to the public for day use. The park is open daily from 8 a.m. until dusk. There are trails for hiking, off-road biking, and equestrians (RED, WHITE, BLUE and YELLOW). No motorized vehicles are allowed. A trails map is located on the welcome kiosk at the entrance. Below is an album of photos of the trails. A bench by the pond.